You might be thinking; how can that be? I’ve never seen a different price level based on income levels. And, you are right. However, when a family is living paycheck to paycheck, there is a significant difference in the number of diapers they can afford at one time. And, everything’s more expensive in small quantities, including formula and food. What’s even crazier? Diapers are taxed — and parents can’t use federal assistance programs like SNAP or WIC to buy them. So, while a wealthier family can go to Sam’s or Costco and buy 100+ diapers in bulk for about $20, a low-income family might have to grab a box of 25 at the 7-Eleven for $11. You do the math. In the end, the low-income family ends up paying more than double for the same amount of diapers. 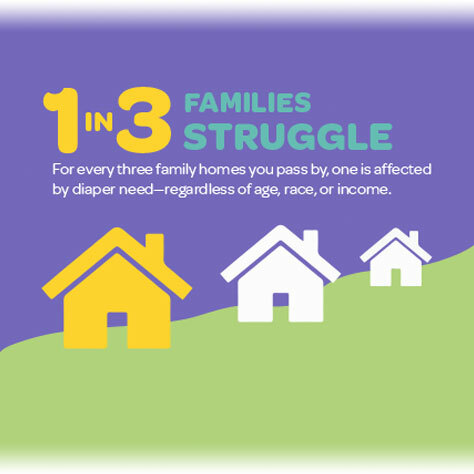 And, not having diapers has a ripple effect on low-income families. If babies aren’t changed frequently enough, they can get severe diaper rash or urinary tract infections – causing pain and more expense. If parents run out of diapers all together, their baby can’t attend daycare, so in turn, the parents can’t work and make money. If you’ve read this far, you are probably ready to buy a car full of diapers to give to working families at this point. But we’ll stop you there. At Baby Basics of Collier County, we are blessed to have a partnership with Sam’s Club who allows us to purchase even more in bulk – if that’s even possible. Your donation to Baby Basics will provide even more diapers to working families in Collier County (Naples) and Bonita Springs. For more information or to give, please click here.